In my first cover story for the magazine, which went up on-line today and will hit newsstands next week, I tell the story of Rick Perry's remarkable rise, with a focus on the enterprise he's built around himself in Texas: a flow of money (campaign contributions coming in; contracts, appointments, and awards from his $800 million in economic development accounts going out) that is unprecedented in scale even in Texas, where the sky's the limit for political donations. Perry's primary rivals have already tried to give this enterprise a name -- the dread alliterative, crony capitalism. The question the piece leaves unanswered is whether the CC charge packs much punch anymore with the Republican electorate. After all, for all of the anti-Wall Street rhetoric in the Tea Party movement, conservative voters have increasingly learned to subordinate populist discomfort with big business to their hatred of big government. Plenty of freshmen congressmen carrying the Tea Party banner got major backing from the Club for Growth, the Chamber of Commerce or individual companies and financiers. I spotted one Tea Party congressman, Tom Graves of Georgia, a Club for Growth favorite, out at a $1,500 fundraiser for himself the night of the final debt-ceiling vote, in the AT&T box at Nationals Park. These associations are not as well known as they should be, but they're no secret either, and they do not seem to give the Tea Party much pause. In Texas, Perry has won reelection three times despite diligent reporting on his enterprise by some of the Texas papers and repeated attempts by Kay Bailey Hutchison and other opponents to tar him with the CC charge. Mustafa Tameez, a political consultant in Houston, told me that this may be partly because Perry's brand of deal-making has such deep regional roots, even if he has carried it to such a new level. "He's from that old-school of Southern Democrats where you can make a deal with a friend and say, that's okay, we're not hurting anybody,'" Tameez said. Will voters elsewhere be as accommodating? 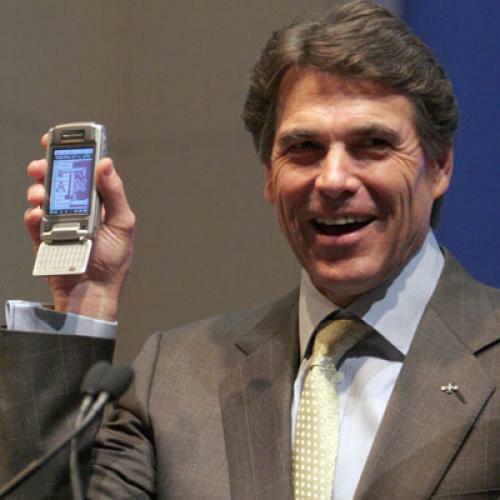 The amount of fodder is seemingly endless -- the $1 billion Medicaid contract awarded to an HMO that gave Perry's campaign account $45,000 in recent years; the vetoing of a Republican-sponsored bill to restrict texting while driving, after AT&T gave $100,000 to Perry the year before; the awarding of tens of millions of dollars from the economic development accounts to unsympathetic big companies like Countrywide and Washington Mutual and biotech startups backed by Perry's top contributors. One would imagine that Perry's rivals could make something of all this, perhaps by trying to tie it to their talking points attacking the Obama administration for the Solyndra failure. So far, though, Perry's rivals are mostly coming at him on other fronts, for his remarks on Social Security and for being soft on illegal immigration (though cronyism may be relevant to that as well, as my piece notes.) But that may be because they know that zeroing in on crony capitalism would mean focusing not only on Perry's Texas enterprise but on their party's general willingness to distinguish between hunky-dory government giveaways to "job-creating" businesses and "wasteful" spending on everything else.